A float featuring stereotyped Jewish figures at a carnival near Brussels has been widely criticised as anti-Semitic. The float in the town of Aalst, 25km (15 miles) from the European Parliament, featured the grinning figures of Orthodox Jews standing on large piles of money. Local Jewish organisations said it was "typical of Nazism of 1939". "In a democratic country like Belgium, this has no place in 2019, carnival or not," they said. The Coordinating Committee of Jewish Organisations of Belgium and the Forum of Jewish Organisations issued a joint statement saying they had lodged a formal complaint with authorities. They highlighted the "crooked noses" and "suitcases of money" used to portray the Jewish people. "The Jewish community naturally accepts humour, this is very important in a society, but there are boundaries that cannot be crossed," the statement said. "At best, it is a disgraceful lack of discernment, especially given the rising context of anti-Semitism in our country and the world, at worst the reproduction of anti-Semitic caricatures worthy of the Nazi era." The European Commission, meanwhile, said it was "unthinkable that these images parade in European streets 74 years after the Shoah", using the Hebrew word for the Holocaust. Asked about the anti-Semitic nature of the float, Commission spokesman Margaritis Schinas said: "We stand firmly against all forms of anti-Semitism". "We Europeans do not have the luxury of taking this lightly… because we have the sad privilege of having experience how this ends," he said. "In the last century, we saw it once and we know how this film ends - and nobody wants to see this film replayed." He also quoted the speech by the Commission's president, Jean-Claude Juncker, on Holocaust Remembrance Day in January, when he said: "Our union was built on the ashes of the Holocaust." "Remembering it and fighting anti-Semitism is our duty to the Jewish community and is indispensable to protect our common European values." Belgian media report that the group behind the controversial float, De Vismooil'n, went to the police after it received death threats over the float. The group were economising on a so-called "sabbatical year" - saving money on their float in this year's parade to invest more heavily in the following year, members told Belgian news outlet HLN. "We came up with the idea to put Jews on our float. 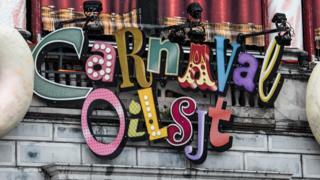 Not to make the faith ridiculous - carnival is simply a festival of caricature," they said. "We found it comical to have pink Jews in the procession with a safe to keep the money we saved. You can have a laugh with other religions too," they told HLN. The newspaper also quoted the town's mayor, Christoph D'Haese, as saying the group "had no offensive intentions".